Originair resumed Jetstream operations today with BAe Jetstream 31 ZK-JSH operating flights OGN 3215/3216 from Nelson to Palmerston North and return this afternoon using the callsign AIR2THERE 7. Originair ceased flying 1 April 2016 and remain grounded for some months before they resumed services on the 23rd of September 2016 using air2there aircraft. Since then air2there has been operating the four times weekly direct service between Nelson and Palmerston North. It seems air2there will operate the Originair Jetstream on their behalf. Originair's Jetstream ZK-JSH about to start as OGN 3215 at Nelson this afternoon as it resumed the air service to Palmerston North. Meanwhile in Auckland another BAe Jetstream, ZK-ECP, has been withdrawn from service and cancelled from the register effective 22 June 2017. A rather forelorn looking Jetstream 32 ZK-ECP (right) with two former stablemates, in Originair colours ZK-ECI (left) and Inflite Charters' ZK-ECJ at Auckland on 10 June 2017. Jetstar seem to be reducing operations on selected regional routes over the winter months. According to a post on routesonline website which drew its information from comparative checking of the Jetstar reservations system services are being reduced from the 24th of July to the 28th of October. Services between Auckland and New Plymouth reduce from 20 to 14 weekly flights. (I did my own checking on this to come up with twice daily flights rather than the 9 weekly flights as in the routesonline post). Services between Auckland and Palmerston North reduce from 27 to 22 weekly flights. 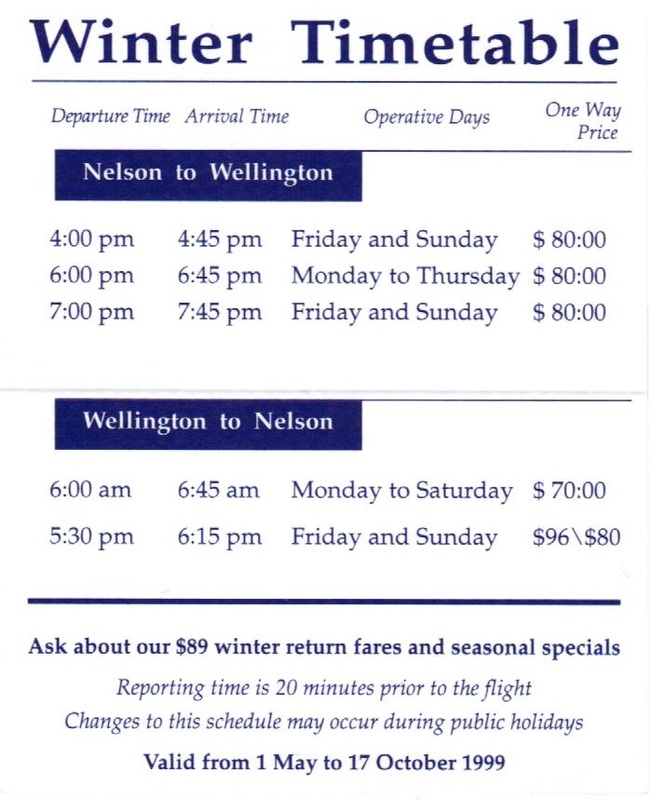 Services between Wellington and Nelson reduce from 3 to 2 daily flights. I don't think there is anything sinister in this approach - I've noticed at various times changes in the Air New Zealand to match the capacity with demand. It makes good operating sense! Budget airline Jetstar has cut back the number of flights between Auckland and New Plymouth, citing a lack of customer demand. A Jetstar spokesperson said the airline had reduced some of its regional flying between mid-July and the end of October to align capacity with seasonal demand in quieter travel months. "Jetstar has operated its full regional schedule of 244 flights a week for the past 16 months without any seasonal adjustments, including 40 flights a week between New Plymouth and Auckland," the spokesperson said. "Following a review of off-peak customer demand Jetstar is reducing some regional capacity on a seasonal basis over three months. "During this period Jetstar will operate 28 flights per week on the New Plymouth-Auckland route." The new schedule would see only two return flights daily. The spokesperson said customers had been transferred to alternative services on the same day as their original booking, but if the alternative service wasn't suitable they could request a full refund. New Plymouth was among five new regional routes announced by Jetstar in August 2015. The move also comes three weeks after the New Plymouth District Council approved a upgrade to the airport's terminal, which is expected to cost between $21.7 million and $28.7m. However, New Plymouth Airport manager Wayne Wootton said the reduction in flights wouldn't affect the upgrade. "These annual fluctuations in flight schedules have been built into our preparations for the new terminal's design," he said. "Normally airlines reschedule every six months. Jetstar have kept their former schedule for 18 months in New Plymouth and their winter schedule will last for three. "Jetstar is bringing a winter schedule into Nelson and Palmerston North too." 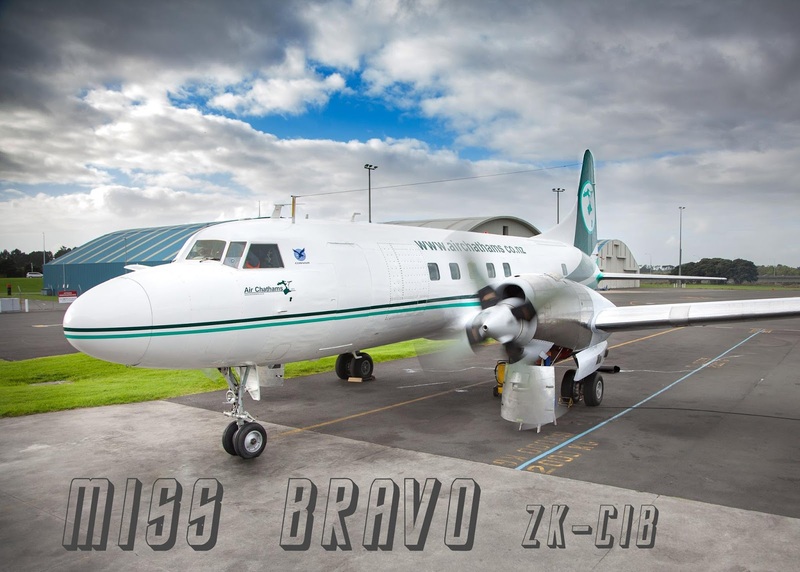 After quite a number of months Air Chathams' flagship, Convair 580 ZK-CIB, is back in the air after major heavy maintenance... And doesn't she look smart, both inside and out! Well done to Duane and the Air Chats engineering team! A top job! And I bet the Chatham Islanders will be pleased to see their plane back on the run looking so good! 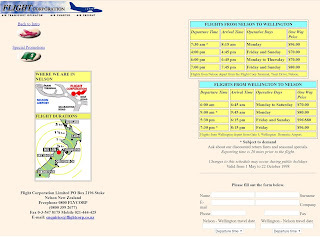 A month before Airways decommissioned its NDB at Wairoa and since then the Air Napier courier flights between Napier and Gisborne have overflown Wairoa. Wairoa Airport is set for expansion, with the Wairoa District Council awaiting a report on extending its 914m sealed runway to take small jets. Wairoa District Council CEO Fergus Power said the primary motivation was to accommodate Hawke's Bay's air ambulance service's Cessna Citation Mustang, expected to save lives through quicker and smoother flights. 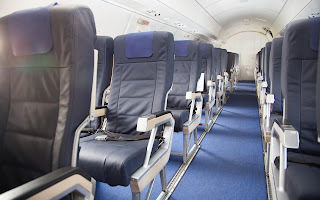 Quieter inside than a commercial jet, its twin engines quickly lift it to still air for a comfortable flight and can retain sea-level air pressure to 21,000ft, of benefit to serious neurological or cardiac conditions. "It is about providing the Wairoa community the same level of medical service and safety that the rest of Hawke's Bay is able to benefit from," Mr Power said. "There is no need for Wairoa to have a sort of B-grade status in the region when we have a tremendous asset which, with a fairly modest investment, will have landing capability for jet aircraft." He said if bigger planes were able to land it would be good safety net, should a natural disaster strike. "The Hawke's Bay Civil Defence Emergency Management Group has recognised that of all of the districts throughout Hawke's Bay, Wairoa is the one with the highest risk of becoming isolated in the event of a major disaster such as what just happened in Kaikoura. "We don't really have a navigable port so if our roading became unusable for an extended period then that airport becomes quite critical." The runway extension has considerable economic development potential, including visitors to the satellite-launching Rocket Lab site in Mahia Peninsula. "These people are often either in senior roles in satellite-manufacturing or satellite-ownership companies. If they can save transport time then they will be attracted to that. Having a direct flight from Auckland to Wairoa will be highly beneficial to those people and we have had expressions of interest from air carriers." The Wairoa District Council owned enough land for a business park, should time-sensitive industries sought to be located beside an airport, and local businesses could also take advantage of air freighting for highly-perishable produce. It could also boost tourism. The council has taken over the licence to occupy the former Wairoa Hawke's Bay Aeroclub and entered a joint venture with Radio Te Wairoa. "We have established a larger capacity to broadcast Civil Defence communications via that radio station but one of the issues with that airport is previously it could be regarded as a comatose airport. "If a light aircraft visited it was touch-and-go as to whether a human being was going to be on site. "By inviting the radio station to partner their personnel can become the meet-and-greet carbon-based life form, helping visitors find transport, accommodation and introduce them to the wonders of Wairoa." He said the airport was regarded as one of the best in New Zealand servicing a small population. "It is very wide, quite long and has the capacity to be extended, so the airport runway could match the length of Gisborne's very easily. "If you have just had a farm accident and your spine is in two pieces, I imagine you would think it was a very good investment." 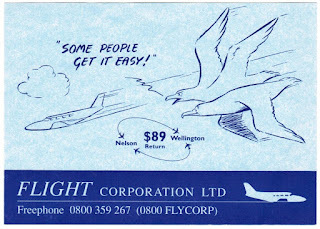 Nelson-based Flight Corporation Ltd was founded by a group of Nelson pilots in 1991 with Alan Pumphrey and Cameron Rodgers being the principal shareholders. Over the years Flight Corporation has expanded its operations to include scheduled services between Nelson and Wellington. 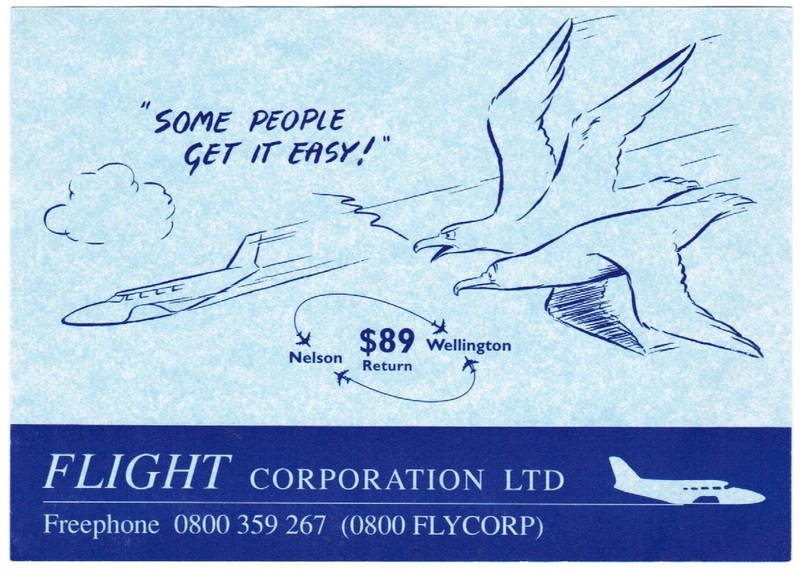 In mid-1993 Flightcorp, as it was more commonly known, commenced scheduled services between Nelson and Wellington. Mainstay of the Wellington service was the contract to fly the Dominion newspaper from Wellington to Nelson. The company initially used their Piper Seneca aircraft to operate this service but later in 1993 a Piper PA31-310 Navajo was added to the fleet. The Navajo was registered ZK-DOM to reflect its contract to carry the Dominion Post. In 1995 the schedule for the Dominion flights saw the Piper Navajo departing Wellington for Blenheim at 6.00am Monday to Saturday as Flightcorp 03. From there it flew as Flightcorp 04 to arrive in Nelson by 7.10am. In the afternoon from Sunday to Friday the Navajo departed Nelson for Wellington as Flightcorp 05 at 4.00pm arriving in Wellington at 4.35pm. Flightcorp also operated the Touchdown Air Ambulance for the Nelson Marlborough Rescue Helicopter Trust. Again ZK-DOM was used for these flights and the aircraft was branded accordingly. Alongside the Navajo a number of Piper PA34 Senecas were used for air ambulance and air charter work. 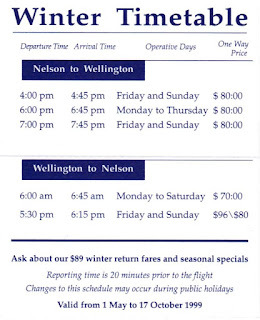 From the mid-1990s additional Wellington flights were offered, especially on Friday and Sunday evenings. To facilitate these two 10-seat Piper PA31 Chieftains were added to the fleet. The additional flights, which in 1997 peaked at 17 flights per week, were not sustainable and by winter 1998 they had reduced to 9 flights a week. 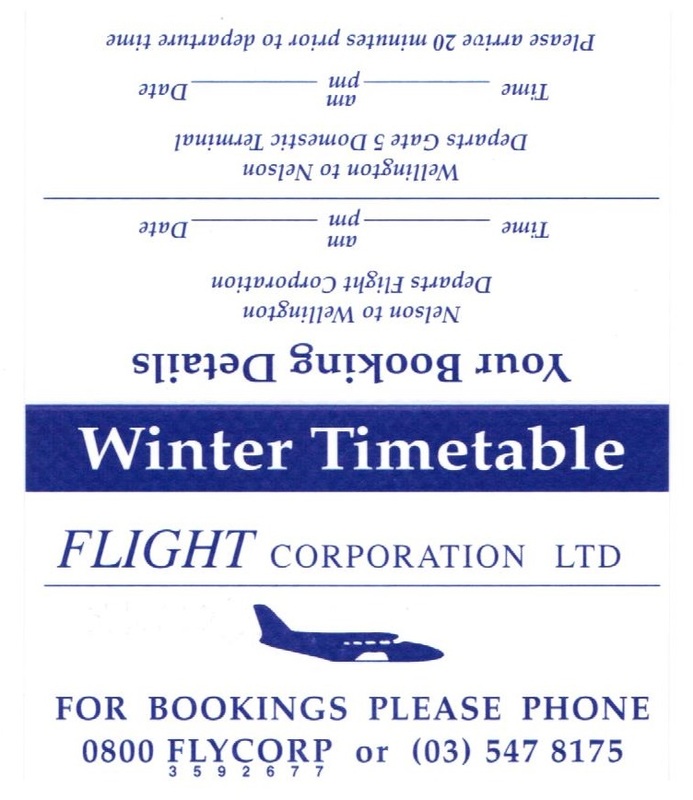 Flight Corporation's timetable as at May 1998... 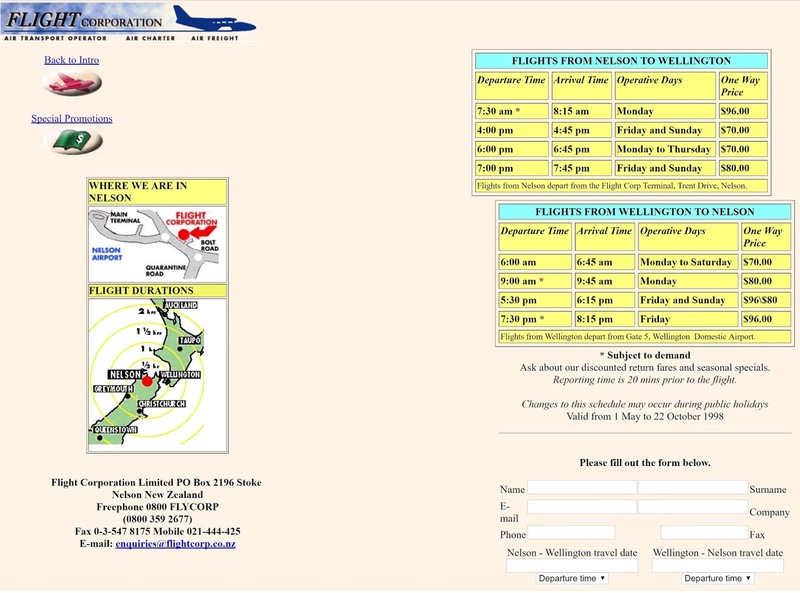 They had a website booking system very early! In 1999 CityJet and Origin Pacific Airways entered the Cook Strait market and this led to the demise of Flightcorp's scheduled services. 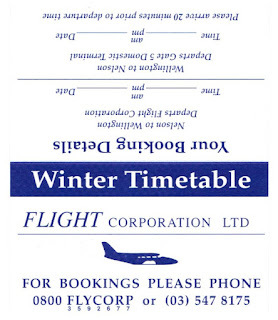 Later that year 1999 Flight Corporation was sold to Simon Palmer and from then on the company focused more on the air ambulance, charter and scenic work. The company later went on to offer flight training. Disaster struck the company on the 30th of November 2004 when Piper Seneca ZK-JAN, while on a charter flight, crashed on the northern edge of the crater lake of Mount Egmont/Taranaki while enroute from New Plymouth to Nelson. Sadly the pilot and his passenger were both killed. At that time Flight Corporation's fleet also included a Cessna 207 and a Cessna 172, both used for charter and scenic flights and a Piper Tomahawk used for flight training. In January 2005 Flight Corporation was sold to Tony McCombe who at that time was the Chief Pilot. At this stage the company was operating aircraft on tourism flights into the Abel Tasman and Kahurangi National Parks and the wider Nelson/Marlborough area as well as continuing to operate the local Air Ambulance service for the Nelson/Marlborough District Health Board. 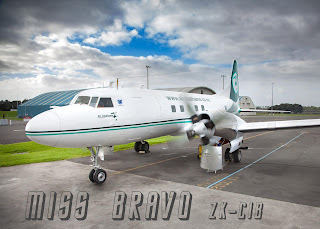 On the 31st of October 2006 the company took delivery of Cessna 402C ZK-VAD with the intention to use it on regular passenger and freight services between Nelson and Wellington. This never eventuated and it was instead used for charter before later being on sold. In January 2009 Paul Proctor bought the scenic division of Flight Corporation. Meanwhile Flight Corporation owner Tony McCombe, concentrated on the building up of the charter and air ambulance services. The scenic operation was rebranded as Flight Corp Scenic and on the 11th of April 2009 this was sold to Sounds Air Travel & Tourism Limited. Flight Corporation Ltd was dissolved as a company in December 2011. We are to happy report that the six week 'C Check' maintenance inspection on our Saab 340 airliner has been completed. The aircraft was completely stripped back down to it's frame and all of its components carefully inspected. Following a refreshment of the cabin interior and a major avionics upgrade in the cockpit to bring the systems in line with future air traffic control regulations, we had the aircraft rolled out of the hanger doors at the end of May and she is now back flying the Auckland to Whanganui route with many happy passengers. 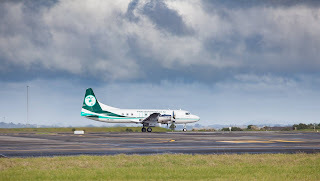 While the Saab 340 was out of action we had the opportunity to regularly fly our larger Convair 580 between Whanganui & Auckland, with great feedback from customers has being received! 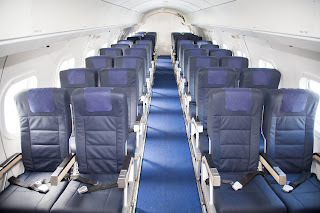 We have also noticed that load factors have increased to numbers greater than a Saab can carry which has prompted us to continue operating the Convair on select flights Friday, Saturday, Sunday & Monday until the end of July at which time we will reassess how things are going. This is great news for the Whanganui service and shows that we are providing the service and meeting our customers expectations! Have you flown into Kaikoura yet??? 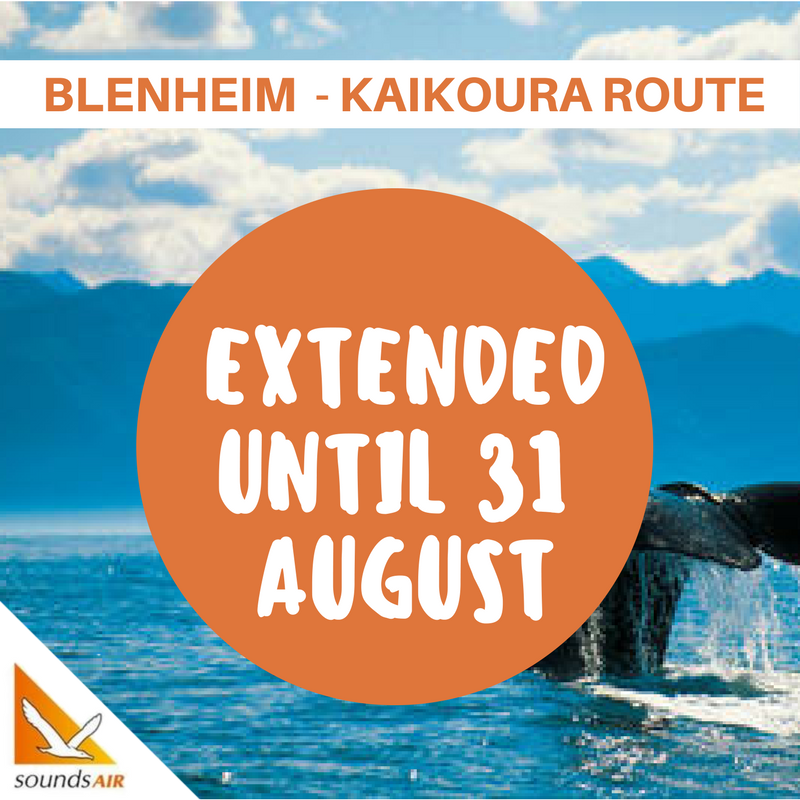 Sounds Air is pleased to announce that flights on the Kaikoura - Blenheim route have been extended until the end of August! We are pleased we can continue to support the region following the disastrous quake of 2016. 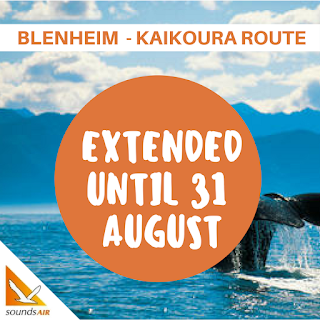 Sounds Air has up to 5 flights per week on the Kaikoura to Blenheim route. Craig Emeny flew to the Chatham Islands in the early 1980s and has been based there since. Raised in Stratford, Taranaki and trained as an RNZAF engineer, Emeny got his pilot's licence when in his late teens and was drawn to the Chathams by a job flying crayfish off Pitt Island. With his wife Marion he went on to establish Air Chathams in 1984 and his services to aviation and the islands' community have been recognised in the Queen's Birthday Honours. Emeny, 61, said his being named Officer of the New Zealand Order of Merit was recognition for the entire team at the airline, many of whom have been with it since it was formed. "There's been a lot of people on the Chats who make things happen - I pick up the award but I think it's an honour for a lot of hard-working people." Ferrying crayfish to Gisborne led to passenger services and the airlines' network grew. In the past 18 months it has picked up routes Air NZ dropped - Whakatane and Whanganui. Over the past three decades Emeny's planes have also been involved in search and rescue operations. He has invested in emergency aircraft and capability for life flight and serious injury transfers to service the island community. The honours citation says the Emenys have supported community fundraisers, often providing free transport for people and freight, and sponsored and supported families. The airline's charters have seen it regularly flying over in New Zealand, Australia and the South Pacific. Providing social links for the Chathams' 600 residents is a source of pride for Emeny. "I think we've provided a service out to the Chathams for quite a long time - it's been reliable and very community focused. We've developed that social and industry base." The airline still flies about 350 tonnes of crayfish a year from the Chathams. Emeny said the islands' fishing and farming economy was going strong and tourism, although limited by accommodation, was growing. Emeny still flies his planes regularly, although he's taking this weekend off to be with his youngest daughter at her school ball. He and Marion have two daughters and two sons. Both their sons are involved in the airline. The terminal... way up the valley!